From 'Occupying' A Spanish Bank To City Hall: Barcelona's New Mayor : Parallels The status quo took a hit in Spanish elections over the weekend. A major upset came in Barcelona with a win by Ada Colau, a prominent activist who fought evictions during Spain's economic crisis. Ada Colau (center), leader of the Barcelona en Comú party, celebrates in Barcelona during a press conference following the results in Spain's municipal and regional elections on May 24. She is the first member of Spain's indignados protest movement to win public office. The caption added by Twitter users: "Welcome, new mayor." Colau is the first of the indignados, or angry ones — Spain's Occupy movement — to win office. She narrowly defeated Barcelona Mayor Xavier Trias in local elections Sunday. Cheers of "Sí se puede!" — "Yes we can!" — went up through the crowd at Colau's campaign headquarters in Barcelona overnight, when vote tallies showed she had won. "This is a victory of David over Goliath," Colau told supporters, beaming. The 41-year-old made her name fighting foreclosures during Spain's economic crisis — by physically trying to block police from serving eviction notices at people's homes. She's been detained by police dozens of times. She has never previously held public office. Two years ago, she testified before parliament at a hearing about Spain's foreclosures crisis. On the panel, Colau spoke right after a representative of Spain's banking industry. "This man is a criminal and he should be treated like one," she said at the time, her voice shaking with rage. Lawmakers' jaws dropped. Colau got a reprimand from parliament, but her speech endeared her to millions of Spaniards hurt by layoffs and austerity. "Our politicians prioritized rescuing Spanish banks, over rescuing Spanish citizens," Colau told NPR in a recent interview, reflecting on that February 2013 parliamentary hearing that catapulted her to fame. Video of her rant went viral on Spanish TV and social media. "I wanted people to wake up and realize that we delegated our democracy to those who drove us to ruin, both economically and politically," Colau says. "Calling him a criminal was the least I could do." In 2009, Colau founded Spain's Platform for People Affected by Mortgages (PAH), a group that works to help borrowers remain in their homes, while struggling to keep up with mortgage payments. Colau served as the group's spokeswoman until last year, when she stepped down to enter politics. In 2013, the European Parliament awarded Colau and the PAH the prestigious European Citizens' Prize for "fighting for European values." 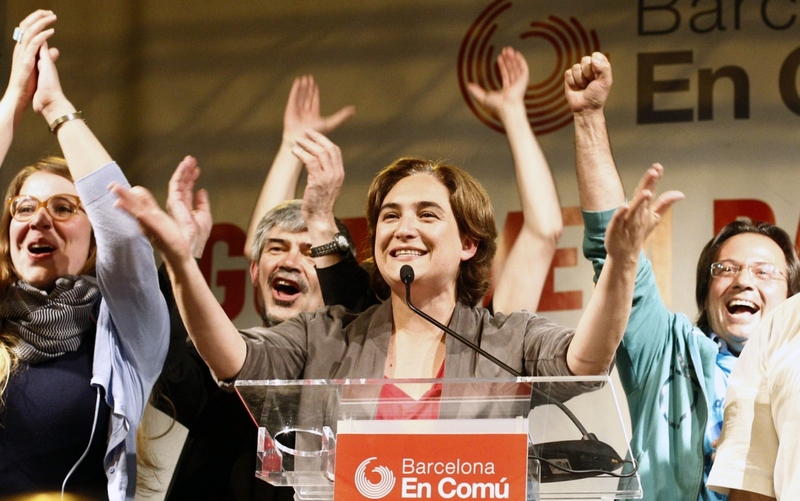 Colau now heads a local Barcelona political faction called Barcelona en Comú — Barcelona in Common, in the local Catalan language — through which she ran for mayor, and won. Her local party is affiliated with Spain's left-wing anti-austerity party Podemos, or "We Can," in Spanish. In local elections across Spain on Sunday, grassroots activists like Colau broke the monopoly of Spain's two main parties, the Socialists and the ruling conservative Popular Party, which have ruled the country for decades. "She's transparent, she's honest, she speaks the language of the people — and she has managed to touch what Barcelona was feeling," says Antonio Roldan, a Spain analyst at the Eurasia Group in London. "The Popular Party had absolute majorities in almost regions and now they have none. So it's a new period of cleaning up the corrupt establishment in some of these municipalities that have been for many years dominated by the two big parties." Podemos is led by Pablo Iglesias, a 36-year-old political science professor with a ponytail. He campaigned for Colau in Barcelona. "We're not like other politicians supported by the banks. Our creditors are the people," Iglesias said at a recent rally, with Colau beside him. Grass-roots activists like Iglesias and Colau hope these local election victories will lead to national ones in parliamentary polls later this year.